THE CONTROVERSIAL ASK.FM website which allows users post anonymous questions to others is to relocate to Ireland according to the Financial Times. The Financial Times reports that Ask.fm’s move to Ireland comes after the Latvian-based firm was bought out by the company that owns Ask.com in August. Ask.com is headquartered in Dublin and it is planned that Ask.fm will move to these offices. The website been the subject of particular criticism both in Ireland and abroad after a number of teenagers who died by suicide did so after after being cyberbullied on the site. Donegal teenager Erin Gallagher (13), who died in 2012, was bullied online including through Ask.fm. Her 15-year-old sister Sharon Gallagher also died by suicide a number of months later. A Business Insider report from last year said that at least nine teenage suicides were linked to the website. 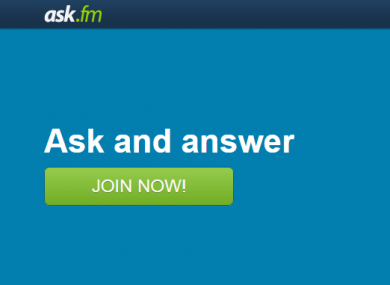 But Ask.fm has said that it has updated its policies and terms of services in the wake of criticism. The site’s CEO says that, although they have not removed the ability of users to ask questions anonymously, they have “provided new and enhanced information” to users about how they can block anonymous questions and report problematic content. The Financial Times also reports that Ask.fm will appoint a a “law enforcement affairs officer” based in Ireland. Email “Ask.fm is moving its HQ to Ireland ”. Feedback on “Ask.fm is moving its HQ to Ireland ”.